Photograph: Jason ReblandoHome stretchRuns begin at 5:45am. Photograph: Jason ReblandoOne Step AheadAkbar, second from left, hits the asphalt. Photograph: Jason ReblandoTouch downPre- and post-race hugs are essential. Photograph: Jason ReblandoIn good handsMany volunteers are working professionals. Since Lawson House YMCA resident Allen got clean two years ago, he’s celebrated his sobriety in a rather unorthodox way: by running the Chicago Marathon. “My clean date was coming up and so I thought, maybe I’ll do the marathon for my two-year anniversary,” says Allen, who is in his fifties, on a recent Wednesday morning. He’s wearing a faded Astros shirt and black tracksuit bottoms, fresh off a one-mile run—a piece of cake for this now wizened long-distance jogger. 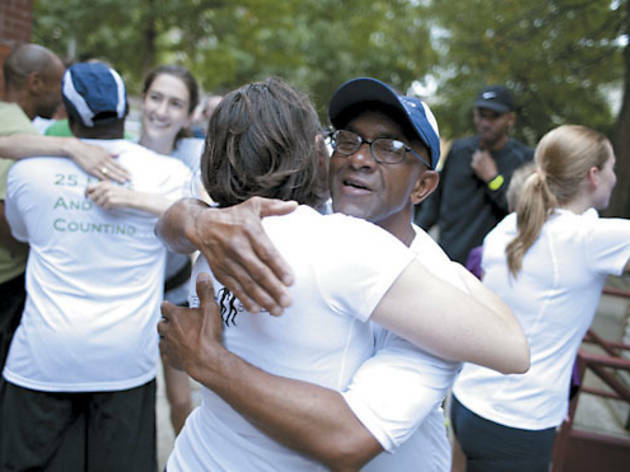 Allen never ran (“except from the police,” he jokes) until he joined Back on My Feet, a national nonprofit that uses running as a self-esteem tool for homeless people. 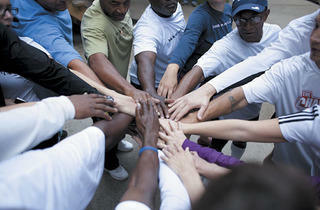 Founded by Anne Mahlum in 2007, the organization has spread to nine cities, including Chicago in September 2010. 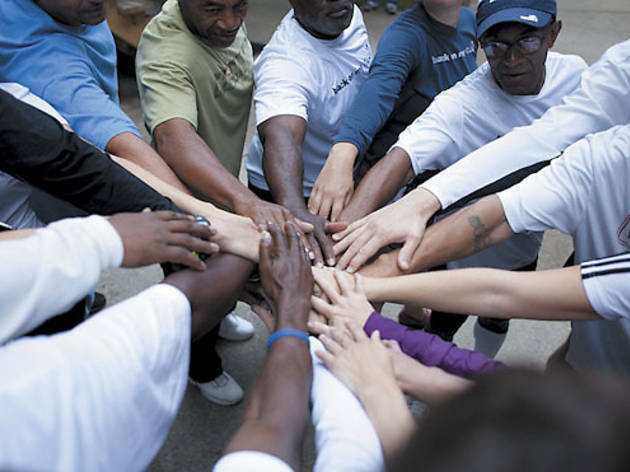 Local volunteers sign up to run alongside transitional housing residents every Monday, Wednesday and Friday morning at four Chicago locations. Allen (there’s a no-last-name policy at Back on My Feet) heard about the organization last year when he saw a YMCA housemate wearing a Back on My Feet jacket. “I thought it would be a good activity for me, [a way] to get some of the toxins from drinking and drugging out of my system,” explains Allen. He signed up in January 2011. “I couldn’t run a block without huffing and puffing,” he says of his first run. 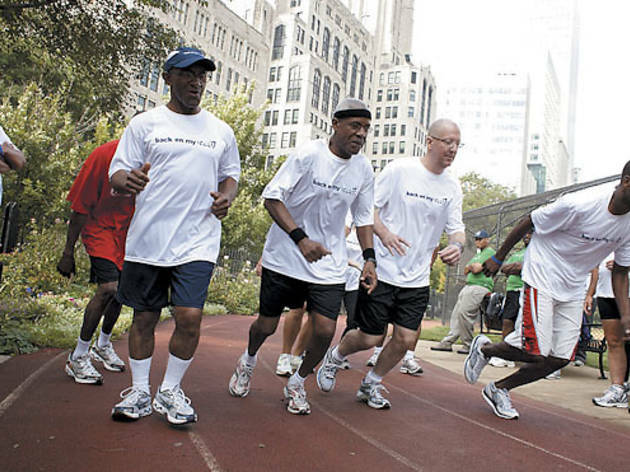 But he kept at it, as did Akbar, a 64-year-old who will run his first marathon Sunday. Akbar heard about Back on My Feet when he was living at St. Leonard’s, a transitional housing facility for the recently incarcerated. “When I was in high school, I tried to run what they call cross country. We had to run two miles, and I couldn’t run a mile,” Akbar says. But when a Back on My Feet member at St. Leonard’s told him about the program, Akbar decided to give it a try. Within his first week, he was running two miles without stopping. Both men are adamant about Back on My Feet’s positive impact. “Running builds character,” Allen says. “I don’t know how, but it do.” He gives the example of a 10K he ran last year, where competitors had to run a mile past the finish line to complete the race. “Now if I didn’t have integrity, I would have run past the finish line and said, I’m done,” Allen says. Cheer on Allen and Akbar on Sunday 7 at 7:30am in Grant Park between Columbus Dr and Monroe St (312-904-9800, chicagomarathon.com). To donate to Back on My Feet, visit backonmyfeet.org.